Ardbeg Distillery has a purifier on their spirit still. Not many stills have such a thing. What is this? 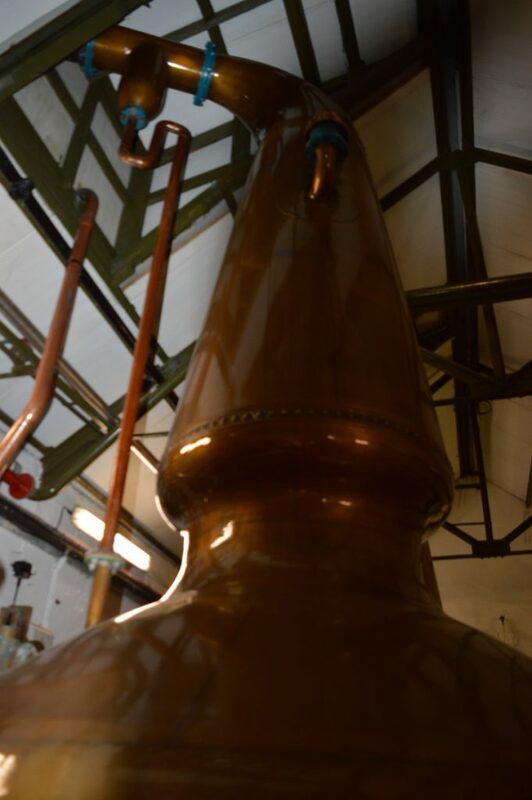 Basically it is a small copper pot on the underside of the lyne arm between the still and the condenser. Some of the heavier vapours which have risen up the still into the lyne arm, fall into the purifier pot and condensing back into liquid, spiral down a three inch copper pipe into the still – (similar to landing on a snake in the childhood game of Snakes and Ladders..) The vapours then get re distilled in the main body of the still. This is a way of creating more reflux. “Reflux” is when vapour condenses back to liquid inside the still. Mickey Heads, Ardbeg Manager does not remember a time when the Ardbeg spirit still did not have a purifier. He has seen old photos and the purifier was on the still away back then. The purifier is what allows Ardbeg to be peated to around 50 PPM, but still be quite “light”. So, Ardbeg spirit is fruity, salty, zesty and is well peated. Octomore spirit and Bruichladdich stills can be seen as a similar case in point – without a purifier.